HACKENSACK, N.J., October 25, 2016 /3BL Media/ - Bulldog Reporter announces the launch of the 2016 Bulldog Corporate Social Responsibility (CSR) PR Awards. This program provides an opportunity to highlight the agencies, organizations and the people communicating good works. Bulldog Awards hold the title of the only US-based PR awards program to be exclusively judged by award-winning journalists – including a Pulitzer! This year’s esteemed list includes contributors from National Geographic Traveler, The Washington Post, USA Today, Forbes and The Oregonian. 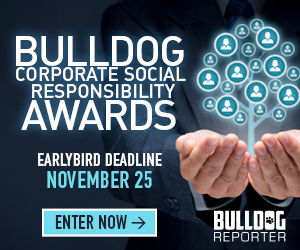 The Bulldog CSR PR Awards program has twenty-eight categories for the agency, organization, campaigns and even a couple for the communicator and executive. Gold, silver and bronze awards are given to worthy candidates in each category, with the Grand Prize winners chosen from a multi-category award winner. Categories, such as Best Green/Environmental Campaign, Best Charitable Giving/Fundraising Campaign, Best Community Relations Campaign and Best Corporate and Community, Non-Profit or NGO Partnership offer options for firms of all sizes who have done some great work on their campaigns over the past year. The opportunity for the individual to be rewarded is offered with this program and includes categories such as Outstanding CSR/Sustainability Communicator and Outstanding CSR/Sustainability Executive. Visit www.bulldogreporter.com to get further information on this and all awards programs. Bulldog Reporter is the leader in media intelligence supplying news, analysis and high-level training content to public relations and corporate communications professionals with the mission of helping these practitioners achieve superior competitive performance. Bulldog Reporter publishes the industry’s best-read, widest distributed trade journal, Bulldog Reporter’s Daily ’Dog. In addition, the company publishes a daily online newsletter—Inside Health Media—that focuses on media relations, and provides media list and media intelligence services through its parent company, MediaMiser. Bulldog Reporter presents industry awards competitions—the Bulldog Awards—which recognize excellence in multiple categories including corporate social responsibility, media relations, digital and social marketing, not-for-profit and overall outstanding professional performance.